the first compilation of that annoy-art seems to have become a certain success, because the second just came out. this time it features a compendium of sound that wants to be located in sachsen-anhalt, which, i guess, could be replaced by any other boring German location/area/district as well. 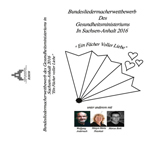 it's a "fächer voll liebe", and that has to be it as a review, because even as the tracklist sounds funny and certain tracks have quite a musicality, i don't want to go deeper into the audio - you'll find out about this semi-schlager-pop-recording-nonsense by yourself.